Originally read in the monthly installments. Secret Wars was Marvel's big event for 2015, and while I grow a little weary of Marvel's every-year-events, I have to give them credit here for the ambition and scope they put behind this particular event. Basically, the multiverse is collapsing until only the "main" Marvel Universe and the Ultimate Universe are left, which then crash into each other and are both destroyed, leaving in place a brand new reality called Battleworld, an amalgamation of several aspects of each universe, all based around various events and popular storylines from across Marvel's history, all ruled by Dr. Doom. However, there is a small group of heroes and villains left from the destroyed universes who know the truth and that something is drastically wrong with this new reality. 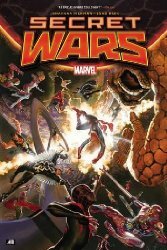 While the merchandising aspect of the event left something to be desired (each of the events, such as House of M, Civil War, Inferno, etc), in addition to being included in the Battleworld, were also given their own miniseries, so in some cases I think that there was something going on in these series that had some impact on the main series, but since I didn't read these various miniseries yet, I definitely feel that I missed something some of the time. Also, the delays in the release of the individual issues of the main series was a little frustrating, as the "new" Marvel universe was revealed before the story behind it was fully realized. These problems aside, I think the story itself holds up well and creates something of a fresh start for many of the characters of the Marvel universe (which is now comprised of characters from both the main universe and the Ultimate Universe), and this may give new readers a better chance at getting to know these characters without being bogged down by decades of previous history. At least, ostensibly, I think that's supposed to be the idea. Either way, if you're a Marvel fan, I think this is something that you should read if you haven't yet.